We are now moving out of Leo Sun and into Virgo. The annual summer Lion’s Gate time is drawing to a close. On Monday, August 25th, we have the New Moon in Virgo. The Sabian Symbol is “2 Guardian Angels.” As we switch from a dominance of Fire Energy to Earth Energy, it will be time to draw down all the inspiration, and enlist the blessing of Angelic support to ground and create in form what is ours to create in the New Paradigm. 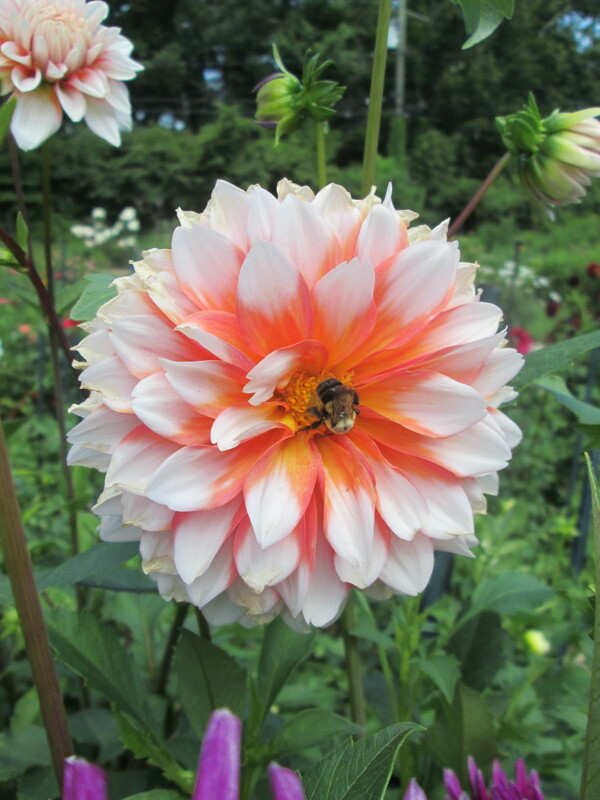 Take a few moments to gaze into the fiery face of Dahlia… call up all the Light Codes that have come in to us this year and feel into the vision coming from your Heart. Like the industrious Bumblebee, gather all the nectar and launch your intentions for your glorious, heart-felt new creations. If you feel ready for all that, Celebrate! If this last month has been some sort of a purge for you, and it has been for many, you may need to use this opportunity to call upon the amplified offering of Angelic Support coming in at this New Moon to help you reconfigure a new dream. October will bring another window for launching that will be more perfect for you. ~ Want a phone session to help balance & integrate all these energetics? Email Denine to schedule. ($50 per 1/2 hr.) Also, a number of us are finding we need to come Out of the Grounding we have been in (which no longer serves) and instead be grounded within our New Light Bodies ~ Auric Field. If you would like more info on that, ask me to send you my latest email about the EP Bimini trip, in which I discuss it.